Nations Press feature news BE INSPIRED: BOY uses his own slippers in substitute for eraser!-Must Share! BE INSPIRED: BOY uses his own slippers in substitute for eraser!-Must Share! SPONSORED LINKS Education is the only wealth that nobody can take it from us. As the opening of classes officially started,parents are busy preparing the needed supplies of their beloved children, but for family who can afford only to sustain their daily needs and no spare amount set aside for schools supplies, some students are making their way to cope with it, some are using recycled notebook just to be in school. 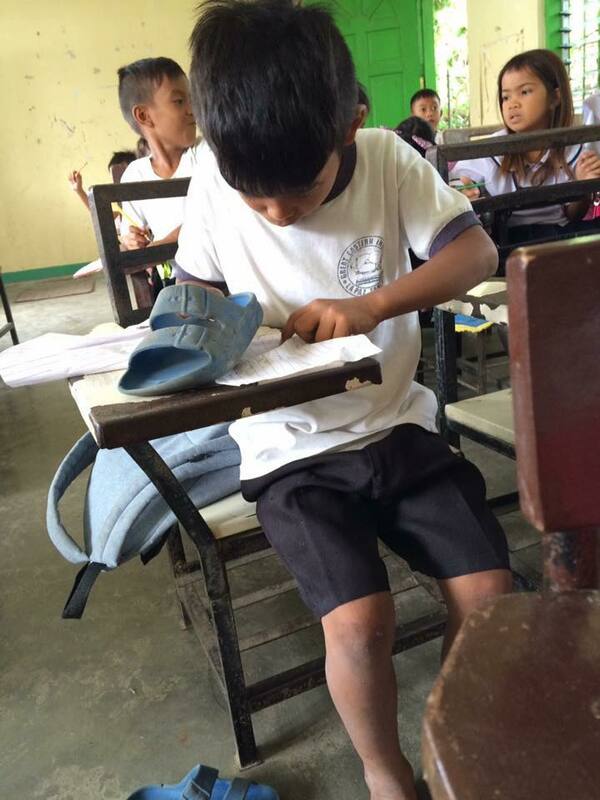 This Grade 2 student Harold Labutong from the Engracio M. Castañeda Central Elementary School in La Paz, Tarlac is now inspiring other students with this photo taken by Facebook user Rosalie Dela Cruz. In the photo, Harold can be seen using his slippers as a substitute for an eraser. The boy obviously didn’t have a real eraser, and decided to use his slippers to erase the mistakes he made instead and it worked!. Harold is one of those poor student shows determination and believe that poverty is not a hindrance to attain success.